The Pivot Trail 429 has been carefully equipped with a choice of branded components. Please Select - one frame of your choice and one build kit option of your choice per bike you wish to purchase. This is that bike. The new Pivot Trail 429 bike is brilliant just about everywhere. It accelerates and climbs like a cross-country bike yet more than holds its own on tough terrain. We took the original Mach 429 Trail, completely reshaped the chassis and gave the bike a truly progressive geometry. The new Trail 429 is even more capable on technical terrain than its predecessor yet doesn’t sacrifice a thing in the quick and nimble departments. Effortless handling, incredible power transfer and blazing acceleration are what set the Pivot Trail 429 apart from so many other trail bikes. 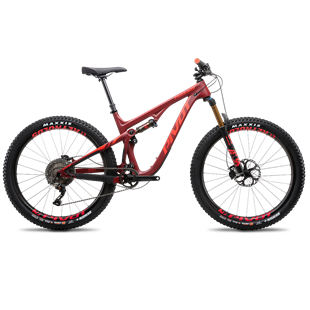 • Fits riders between 4'11" and 6'7"
The carbon Trail 429 feels absolutely rock solid. It holds a line firmly, and really reacts when you steer, lean it or throw it round berms. When pumping edges and dips, it’s obvious how well it builds speed, with or without power through the drivetrain. There’s proper zip when you sprint too, and it surges up climbs with energy…This urgency means it’s one of the best climbing trail bikes around. …the dw-link suspension is effective, more optimised for speed than comfort and cushioning … the Pivot rips through terrain at a lick, and rewards physical efforts by feeling lightning quick. It’s a stunning, speedy machine for longer loops and perfect for just messing about in the woods too.